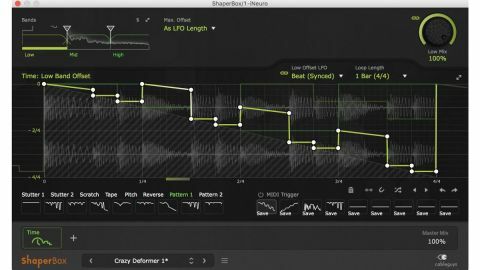 A clever new application of Cableguys’ LFO-driven framework, TimeShaper is creative, fun and priced just right. One of three new plugins in Cableguys’ Shaper line (the other two being FilterShaper Core and WidthShaper), TimeShaper (which runs in the VST/AU ShaperBox plugin - see What’s in the ShaperBox) modulates the position of a virtual ‘playhead’ in the incoming audio signal relative to its linear playback position. This results in all manner of glitching, beat repeating, stuttering, warping, scratching, reversing, tape stop/start and pitching effects. The modulation signal itself is generated by an LFO, the waveform of which is drawn into the graphical curve editor that dominates the GUI. The speed of the LFO can be tempo-synced to the host DAW or set manually in Hz. Most of the time, you’ll be running it synced, although unsynced mode, maxing out as it does at 5.24kHz, certainly has plenty of FM/AM/ PM-esque creative potential for those who dare to push the boundaries. The LFO editor shows the incoming waveform in real time with the LFO waveshape overlaid on top, against a background grid divided into 16 steps horizontally and four main levels vertically. The Loop Length - ie, LFO speed - ranges from 1/128 to 32 bars, while the maximum range of the LFO - ie, the greatest extent of time by which the input signal can be offset - can be set to automatically match the Loop Length or fixed at 1, 2, 4 or 8 bars in the Max Offset menu. The editor implements the same flexible node-based system as TimeShaper’s stablemates for the construction of intricate curves and sequences. Fundamentally, the green line represents the time offset, with playback position unaffected when it’s at the top of the display, and displaced by the Max Offset amount at the bottom. With Loop Length set to 1 Bar and a four-to-the-floor drum loop playing, for example, setting the curve at beat 2 to the ‘-1/4’ line pulls the audio back in time by one quarter-note, so you’ll hear the kick drum from beat 1 instead of the expected snare. For that sort of basic beat rearrangement and stuttering, Step Draw mode - activated in the palette of tools to the bottom right of the display - adds a square step, defined by four nodes, to the curve, one grid column wide (so a 16th-note if Loop Length is 1 Bar, an eighth-note if it’s 2 Bars, etc) at the point clicked. Dragging left and right without any vertical deviation before releasing the mouse buttons extends the step, and moving it up and down obviously sets its timing offset. With Step Draw mode disabled, clicking in the display adds a node. Dragging nodes around (with the option of snapping them to the grid) shapes the curve, much like altering the frequency response in an EQ plugin, and right-clicking a node toggles it between three curvature levels: very curved, slightly curved and sharp. TimeShaper runs inside Cableguys’ new ShaperBox “creative effects rack” (VST/AU), which serves as a host plugin for it and four of their other processors: VolumeShaper 5, PanShaper 2, and the all-new WidthShaper and FilterShaper Core. All of them have been designed or redesigned to make their interfaces similar - the LFO editor, preset waves and snapshots are now universal. The effects are loaded into the plugin individually in whatever order you like; each one has a bypass button; a shared user snapshot palette enables rack-wide MIDI triggering of presets; and all LFO waves are visible (very faintly) in all LFO editors. The biggest advantage ShaperBox brings to the table over just using its contents as discrete plugins (which you can’t, incidentally) is the saving and recall of combination presets, of which there are already loads, alongside each effect’s own patches, in the nifty cloud-based patch library. We don’t know what else is in the pipeline, but we hope the roadmap includes loading multiple instances of each effect, and routing the processed outputs of individual frequency bands between them in series and parallel. Whenever the green line is horizontal, the audio plays back at its original speed. If the line curves or ramps down, however, audio playback is slowed as the offset progressively lengthens; while upwards movement speeds things up by progressively shortening the offset. The degree of the speed change depends on the angle of the ramp or severity of the curve, and by making the offset progression slower than the playback, the sound actually goes into reverse. Once your designed curve starts to get really hectic, the temporal mathematics of it all is enough to make your head spin, but the playback position indicator on the waveform, animated offset bar at the bottom and grey ‘audio stop’ indicator in the background give a very clear indication of what’s going on. As if all that weren’t enough, TimeShaper is a multiband processor, with the two crossovers in the band editor at the top dragged left and right to define up to three frequency bands, at 6dB or 12dB/octave slopes. Each band is effectively its own colour-coded instance of TimeShaper (click one to flip the GUI over to it), opening up the potential for truly complex rhythm-scapes and crazy band-split weirdness, although Loop Length and wet/dry Mix are linkable between all three. Like the other Shapers, TimeShaper also includes a set of categorised banks of preset waveshapes (72 in all) to use as starting points, and nine MIDI-switchable user snapshots into which the current wave can be saved with a click. TimeShaper successfully applies Cableguys’ tried and tested freeform LFO modulation concept to tape delay-style audio playback, and sounds great doing it - the scratching effects are particularly impressive. As you might expect, it’s particularly good at funking up drums and percussion, but it also does amazing things - both subtle and transformative - to vocals, guitars, synths and other melodic material. The precision with which the curve can be shaped lets you take control of time in microscopic detail, and playing around with the Loop Length and Max Offset settings can profoundly change things up at a stroke. ShaperBox is cool, too, although it doesn’t do a great deal yet, beyond enabling group presets to be saved and loaded, and centralising MIDI triggering of snapshots. The only things missing are band bypass buttons (you can only solo them) and a proper manual, but TimeShaper is one of the best warping tools (a very reasonable amount of) money can buy.